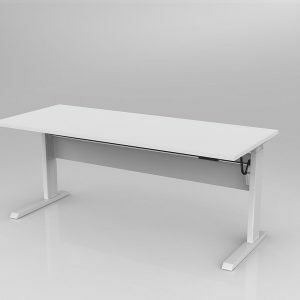 Axis Electric Height adjustable desk with worktop size of 1200mm x 750mm. White Powdercoat, flat foot design. 25mm Studio White worktop with ABS edge. Powered height adjust up/down rocker switch. 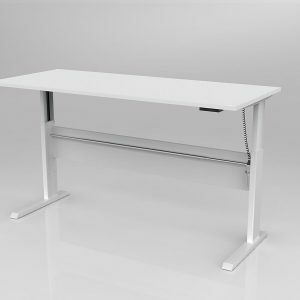 Adjustable from 685mm -1205mm (including 25mm worktop). Max load on worksurface 50kg. 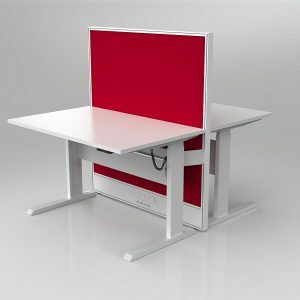 Includes white melamine modesty panel. 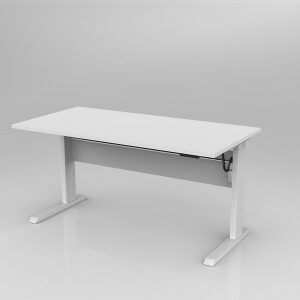 Axis Electric Height adjustable desk with worktop size of 1500mm x 750mm. White Powdercoat, flat foot design. 25mm Studio White worktop with ABS edge. Powered height adjust up/down rocker switch. Adjustable from 685mm -1205mm (including 25mm worktop). Max load on worksurface 50kg. 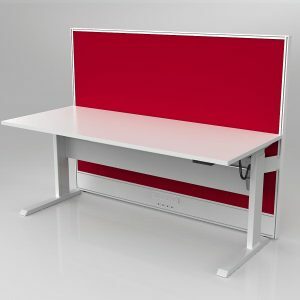 Includes white melamine modesty panel. 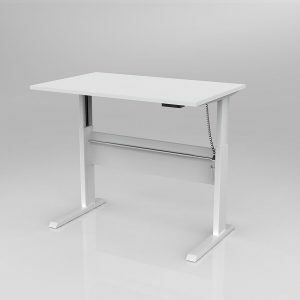 Axis Electric Height adjustable desk with worktop size of 1800mm x 750mm. White Powdercoat, flat foot design. 25mm Studio White worktop with ABS edge. Powered height adjust up/down rocker switch. 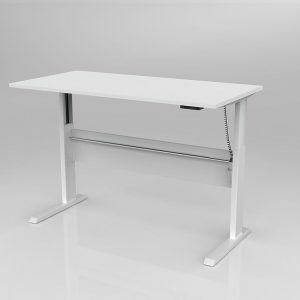 Adjustable from 685mm -1205mm (including 25mm worktop). Max load on worksurface 50kg. 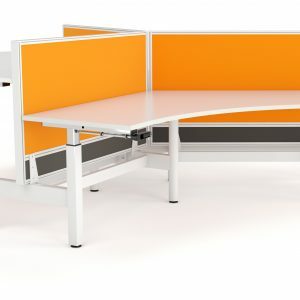 Includes white melamine modesty panel & stiffener bar. 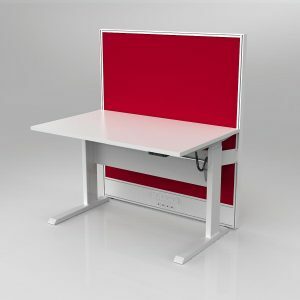 Axis Electric Highrise Single Sided Desk and Screen setting with 1x worktop size of 1200mm x 750mm. 25mm Studio White worktop with ABS edge. White Powdercoat, flat foot design. Powered height adjust from 685-1205mm with up/down rocker switch. Includes modesty panel, stiffener bar, brackets and cable ducting with holes punched for GPO & Data outlets. White Powdercoat Flat foot leg. Studio screen 1350mm high upholstered in Breathe Fabric. 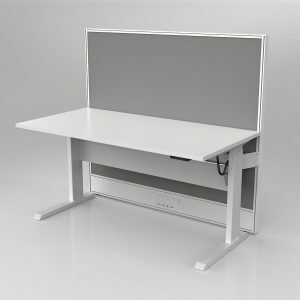 Axis Electric Highrise Single Sided Desk and Screen setting with 1x worktop size of 1500mm x 750mm. 25mm Studio White worktop with ABS edge. White Powdercoat, flat foot design. Powered height adjust from 685-1205mm with up/down rocker switch. Includes modesty panel, stiffener bar, brackets and cable ducting with holes punched for GPO & Data outlets. White Powdercoat Flat foot leg. Studio screen 1350mm high upholstered in Breathe Fabric. 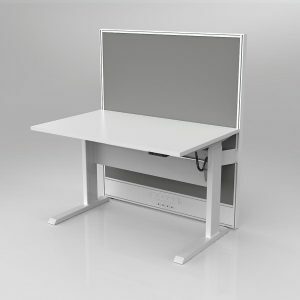 Axis Electric Highrise Single Sided Desk and Screen setting with 1x worktop size of 1800mm x 750mm. 25mm Studio White worktop with ABS edge. White Powdercoat, flat foot design. Powered height adjust from 685-1205mm with up/down rocker switch. Includes modesty panel, stiffener bar, brackets and cable ducting with holes punched for GPO & Data outlets. White Powdercoat Flat foot leg. Studio screen 1350mm high upholstered in Breathe Fabric. 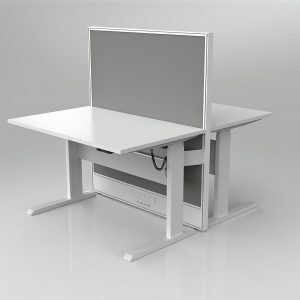 AXIS Winder Height Adjustable Workstation, 3 pod includes Frame and worktops only. 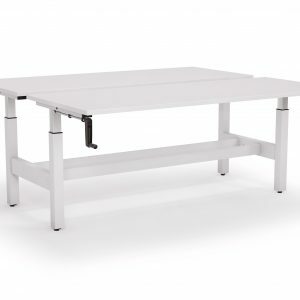 Worktops 1200mm x 1200mm x 750mm white. 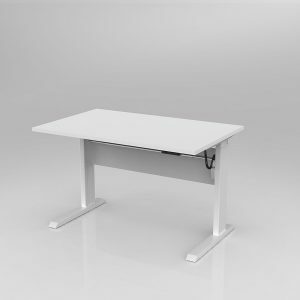 Worktop height 660mm – 1060mm including worksurface. Weight rating of 100kg. Winder handle can be Left or Right side of worktop. 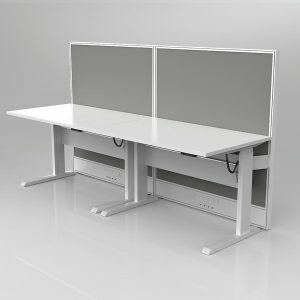 Screens can be purchased separately made to order. 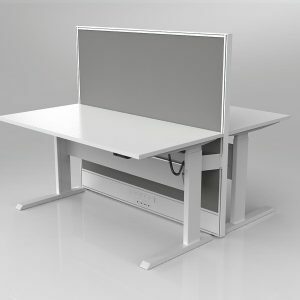 Axis Electric Highrise Double Sided Desk and Screen setting with 2x worktop size of 1200mm x 750mm. 25mm Studio White worktops with ABS edge. White Powdercoat, flat foot design. Powered height adjust from 685-1205mm with up/down rocker switch. Includes modesty panel, stiffener bar, brackets and cable ducting with holes punched for GPO & Data outlets. White Powdercoat Flat foot leg. 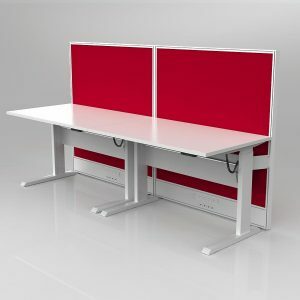 Studio screens 1350mm high upholstered in Breathe Fabric. 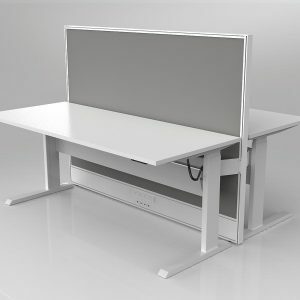 Axis Electric Highrise Double Sided Desk and Screen setting with 2x worktop size of 1500mm x 750mm. 25mm Studio White worktops with ABS edge. White Powdercoat, flat foot design. Powered height adjust from 685-1205mm with up/down rocker switch. Includes modesty panel, stiffener bar, brackets and cable ducting with holes punched for GPO & Data outlets. White Powdercoat Flat foot leg. Studio screens 1350mm high upholstered in Breathe Fabric. 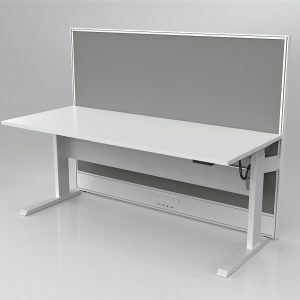 Axis Electric Highrise Double Sided Desk and Screen setting with 2x worktop size of 1800mm x 750mm. 25mm Studio White worktops with ABS edge. White Powdercoat, flat foot design. Powered height adjust from 685-1205mm with up/down rocker switch. Includes modesty panel, stiffener bar, brackets and cable ducting with holes punched for GPO & Data outlets. White Powdercoat Flat foot leg. Studio screens 1350mm high upholstered in Breathe Fabric. 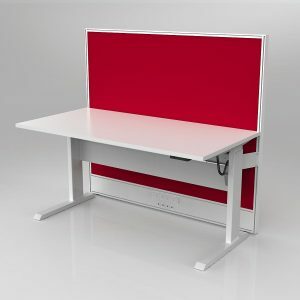 Axis Electric Highrise Single Sided Desk and Screen setting with 2x worktop size of 1200mm x 750mm. 25mm Studio White worktop with ABS edge. White Powdercoat, flat foot design. Powered height adjust from 685-1205mm with up/down rocker switch. Includes modesty panel, stiffener bar, brackets and cable ducting with holes punched for GPO & Data outlets. White Powdercoat Flat foot leg. 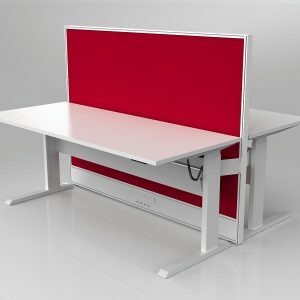 Studio screens 1350mm high upholstered in Breathe Fabric.